A critical factor in predicting fashion trends is colour. For the Fashion Colour Spring 2008, according to the colour gods Pantone who are an industry authority in predicting the upcoming colours we can look forward to "Refreshing splashes of invigorating brights (which) punctuate classic, versatile neutrals". Though this refers to Spring (March to May) in the northern hemisphere, we do know that the colours that the industry promotes will spread from the haute couture fashion houses in Paris, Milan to the rest us wherever we are. So it is always good to prepare early and to keep an eye out for the delecious changes coming up. The following comes from the fashion colour report from Pantone. 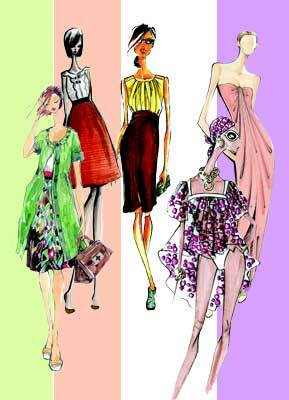 Variations and combinations on these key fashion colours yield an amazing, uplifting, and distinctive ensembles. You will be refeshed and revitalised in both your fashion garments, totes, and of course ... your jewellery colours.